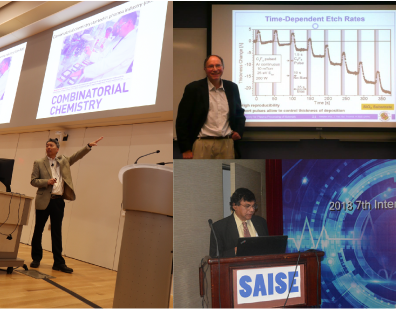 Stay up-to-date on the latest research and build relationships with academics at the MSE Seminar Series, which bring experts from around the world to campus to discuss their recent findings. Everyone is welcome! MSE Seminars are held Fridays from 1:00 - 2:00 p.m. - in 2108 Chem/Nuc Bldg during the Fall Semester, and in 2110 Chem/Nuc during the Spring Semester - unless otherwise noted. You can find the complete line-up, as well as others of potential interest, on our events calendar. I Get Diversity, But What Is Inclusion...in STEM? Hard and Soft Matter in Conservation Science: How Did I Get Here? February 20 To FIB or Not to FIB? Charles "Chip" R. Eddy, Jr.
February 1 Tailoring Ceramic Materials for Energy Conversion and Storage Devices – Are We Gambling with Dopants? Professor Mueller has been rescheduled for May 3. Please note day, time and location. Room 1302 Chemical/Nuclear Eng. Bldg. Room 2110 Chemical/Nuclear Eng. Bldg. Physical Scientist, Science & Technology Mgr. Institute of Chemical Sciences and Eng. September 10 Soft Matter Construction w/Stimuli-Responsive Biopolymers & Electrochemistry Soft Matter Construction w/Stimuli-Responsive Biopolymers & Electrochemistry." October 8 Neutron Scattering Study of the Fe-based Superconductors. February 5 This seminar has been rescheduled for March 26. February 12 This seminar has been rescheduled for April 9. March 26 Secondary Ion Mass Spectrometry at NIST: From Nuclear Forensics to Drug Delivery.